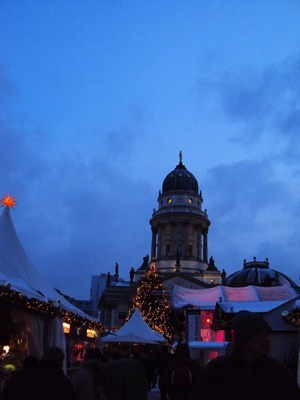 I wasn’t around for Christmas last year, and so had to experience Berlin’s greatest December attraction–the numerous and varied Weihnachtsmärkte (Christmas markets)–in their slightly depressing, Christmas-cheer-is-over-and-January’s-only-just-begun, post-New Year’s form. That means, of course, that this year I am experiencing them as if for the first time, delighting in the gaiety, the star-shaped lights, and the abundance of alcohol in a number of fruity, spicy, and all-around delicious incarnations. Two days ago I went to the market at Gendarmenmarkt, surely one of the prettiest squares in Berlin, for lunch with my Parisian friend Judith, whose office is directly on the corner. I came back with the most perfect pair of elfin winter slippers I ever could have dreamt of (right). We all got Glühwein and sat down at a long table in one of the many enclosed restaurant areas to warm up. When the waitress came around to ask for our orders we explained that we weren’t planning on ordering anything, but just needed some time away from the cold, and could she let us stay and not turn us out into the painful winter? Sure, she replied. As long as there’s no one else waiting you can stay here. 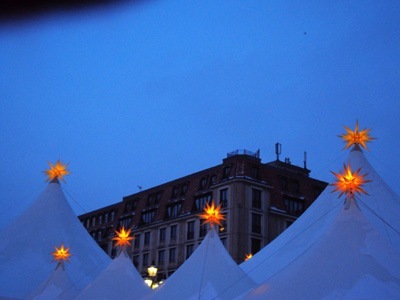 Christmas spirit is apparently alive and well in der Hauptstadt! Finally, we stopped back at the stand where I had found my winter slippers, and I caught a quick shot of two penguins peeking out from stacks of what I like to call cloud boots.